Who was Santana and why was this Native Indian chief famous? Summary: Santana (1830-1878) also known as Set-tainte or White Bear Person was a famous chief of the Kiowa tribe in Oklahoma. Santana negotiated numerous times with the US government and signed various treaties during a protracted war in an effort to prevent settlers and prospectors invading Kiowa tribal territory. The following fact sheet contains interesting facts, background history and information about the life of Santana and the events in history that led to his fame as a great Native American Indian leader. Santana grew up in a turbulent period when the first white interlopers arrived in Kiowa territory. The Native American Plains Indians had to witness the slaughter of buffalo as a white man's sport. Buffalos were were extremely important to his people - the source of food and clothing. Buffalo hide was used to make their teepees. Santana witnessed the wanton slaughter of entire herds that left vast areas of grassland littered with the rotting flesh of hundreds of animals. The killing of the buffalo also served as a weapon against the Great Plains Indians, used by the US government and military, to starve the Native Indians into submission as a first step toward the near-genocide and subjugation of a free people. When he was 14 years old Santana underwent a Vision Quest, in accordance with the traditions of his people and became a warrior at this young age. He joined in the conflicts against the Cheyenne and Ute nations and extended his raids into Texas and Mexico and along the Santa Fe Trail. Santana gained a reputation as an excellent warrior, and in his twenties, he became a chief of the Kiowa. He upheld the traditional values of the Kiowa nation and demonstrate great courage in battle. By the 1860s had risen to a position of importance among the Kiowa tribe. At that time, the principal Kiowa chief was Chief Little Mountain. In 1865, Santana participated in the negotiations that led to the Treaty of the Little Arkansas River. Like most treaties of its type, the agreement failed to gain peace in the territory. The Native Americans viewed the Treaty of the Little Arkansas River as just another attempt to pacify Native American Indians whilst continuing to take their lands. During this tumultuous period great enemies emerged. General William T. Sherman was commander of the U.S. forces in the West supported by General Philip Sheridan and Lt. Colonel George A. Custer. These men detested the Indians and treated them accordingly. The Kiowa witnessed their territory reduced to a small reservation. Santana ignored the treaty and continued to raid settlements and harass white settlers. The unstable situation worsened significantly in 1866 with the death of the Kiowa principle chief Little Mountain. Chief Little Mountain had been a strong leader and maintained the unity of the Kiowa clans for many years. With his death the unity disappeared and leaders, including Santana, vied for position as principle chief. Santana favored armed resistance whereas Chief Lone Wolf and Chief Kicking Bird favored peace. Their fierce competition and their efforts to prove who would best replace Little Mountain, resulted in a wave of raids against the U.S. Army and white settlers across the southern plains during the fall of 1866 and into 1867. 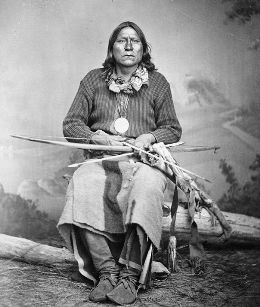 Santana�s exploits and valor in battle earned him prestige with the Kiowa, and he was made one of the tribe's representatives at the Medicine Lodge Treaty council at Kansas in October 1867. The Medicine Lodge Treaty council was attended by more than 5,000 Native Indians including the Kiowa, Comanche, Kiowa Apache, Cheyenne, and Arapaho tribes. The 7th Calvary was on hand to protect the white negotiators. Although Santana agreed at the treaty council that the Kiowa tribe should live on reservations, the Native Indians delayed their relocation. Colonel George Custer therefore kept Santana as a hostage until the tribe completed the move. The Medicine Lodge Treaty signed in October 1867, did not last. As more and more settlers came into their lands the Kiowa resumed their raids. General Sheridan was ordered to devise a plan to break the will of the Kiowa tribe. General Philip Sheridan�s winter campaign against the Native Indians during 1868-1869 was merciless, brutal and bloody. The U.S. military, under Colonel George Custer not only killed warriors, but also women and children. During the violent campaign their homes and horses were also destroyed. In the face of such destruction Santana and Chief Lone Wolf (Guipago) were forced to surrender. The two chiefs approached Colonel George Custer on December 17, under a flag of truce. Custer ignored the truce and arrested the two chiefs. For the following three months, Custer tried to get permission to hang them but in early 1869, they were freed, owing to the efforts of Chief Kicking Bird (Tene-angopte), who promised that the Kiowa would stop raiding and return to the reservation. In 1871, Chief Santana, Chief Big Tree (Adoeete) and Chief Satank (Sitting Bear), led a large party of Kiowas off the reservation and joined forces with a Comanche party, ostensibly to hunt buffalo in Texas. The Native Indians spotted a wagon train traveling along the Butterfield Trail. The combined force of warriors attacked the 10 freight trains hoping to steal guns and ammunition. Seven teamsters were killed. Santana and the others then returned to the reservation. The Indian agent questioned Santana about the raid. Santana admitted that he had led the raid, and that it was justified by the the poor treatment they received on the reservation. On June 8, 1871 the Indian agent turned them over to General Philip Sheridan, who sent the three chiefs to Jacksboro, Texas to stand trial for murder. On the way to Jacksboro, Satank, an elder of the Koitsenko and Crazy Dog warrior societies, was killed while attacking a guard. Santana and Chief Big Tree (Adoeete) were convicted of murder and sentenced to hang. At his trial, Santana warned what might happen if he were hanged. Edmund J. Davis, governor of Texas, fearful that the Kiowa would never let the death of Santana go unanswered, commuted his and Adoette's sentences to life imprisonment. Santana was sent to the prison at Huntsville, Texas. Chief Santana and Adoeete remained in jail for two years. The Kiowa tribe were told that the two would be released if there was no further conflict. For two years, the Kiowa stayed on the reservation and caused no problems. Governor Davis then placed pressure on federal agents to parole Santana and Adoeete. Chief Santana and Chief Big Tree (Adoeete) were released on August 19, 1873. Chief Santana returned home following his two years incarceration. Furious at the treatment he had received Chief Santana instigated armed resistance against the whites. Both the Kiowa and the Comanche harassed settlers in Oklahoma and the Texas panhandle was subject to raiding parties as the tribes again went on the war path in a desperate attempt to to stop the slaughter of the buffalo and retain the Native Indian culture and way of life..
As Chief Santana grew old, a bitter and angry man, he suffered various health problems and was no longer able to act as war chief for his tribe. He continued to sit on the war council and was often present to assist during attacks by US soldiers. Santana, along with Chief Big Tree (Adoeete), were again taken into custody and imprisoned for violating their parole. Chief Big Tree (Adoeete) was held in the guardhouse at Fort Sill and Chief Santana was returned to the Huntsville State Prison on September 17, 1874. Chief Santana never again stepped out of that prison. He died on October 11, 1878, after having committed suicide by jumping out of a second-story window of the prison hospital. Chief Santana was interred in the prison cemetery until 1963, when permission was granted to remove his remains and rebury them at Fort Sill.